Apple could start its own subscription news service. What’s it like to use an external graphics card with a Mac? Could a cheaper HomePod be coming soon? We also feature your comments and questions for Leif Johnson, Roman Loyola, Dan Masaoka, and Michael Simon in the Macworld Podcast, episode 601. Here are relevant links to get more info on the stuff we discussed on the show. Apple Watch Series 4 and watchOS 5 rumors: Are third-party watch faces on the way? 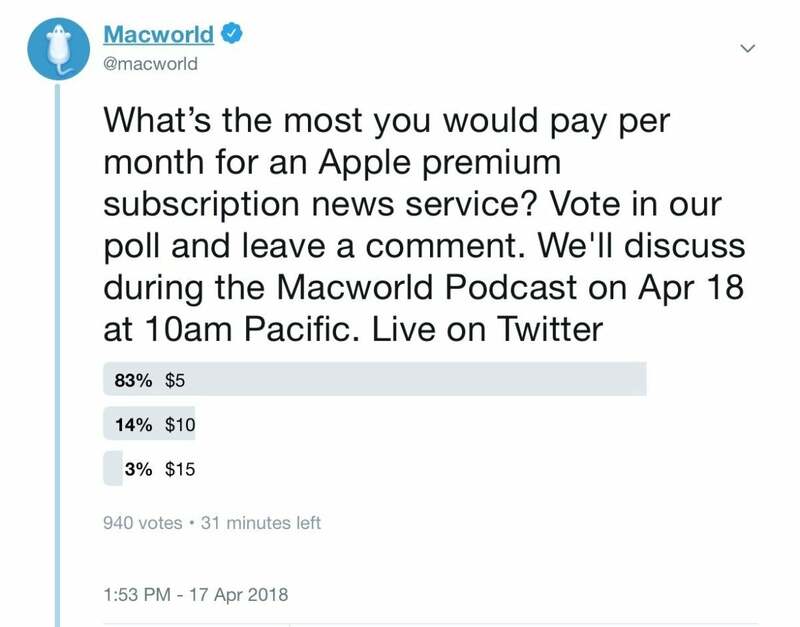 Before the show, we asked (via Twitter) what’s the most you would pay per month for an Apple premium subscription news service? Here are the results. The Macworld Podcast broadcasts live on the internet on Wednesdays at 11 a.m. Pacific. You can watch on Twitter via Periscope or on the Macworld YouTube channel. Can't watch us live? An edited video version will be available in iTunes a couple of hours after the live show.